Bloomex - Order Flowers Quickly and Securely for Canada Delivery :: Order from a Trusted Canadian Online Florist - NEW at Bloomex: Laura Second and Lindt Christmas Gift Baskets! 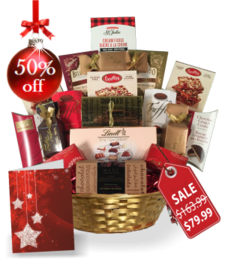 NEW at Bloomex: Laura Second and Lindt Christmas Gift Baskets! Just in time for the holidays, Bloomex announces the arrival of some decadent and delicious new gift baskets! Bloomex is happy to offer chocolate lovers some truly delightful options featuring the excellence of premier brands: Laura Secord, and Lindt master chocolatiers. 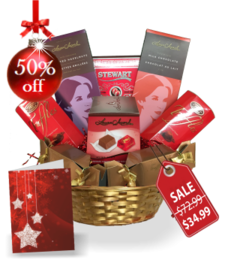 And as an added bonus, we have marked down all Laura Secord and Lindt baskets HALF PRICE as our gift to you! Laura Secord is one of Canada's most beloved quality chocolate brands, beginning as a small candy store in Toronto, Ontario. 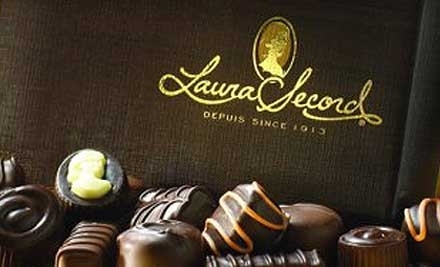 New stores kept opening and today Laura Secord is the largest and best-known chocolatier in our nation. Now you can send and enjoy the richness of Laura Secord chocolates in a series of four beautiful gift basket options. Each basket contains an assortment of tasty treats, such as Laura Secord Chocolate Bars Milk Chocolate & Sea Salt Caramel from the Laura Secord "Gifts to Share Collection." We have combined these Laura Secord items with other decadant treats like Peppermint Crisp, Gourmet Hot Coco, Shortbread Fingers, Dark Chocolate Fondue, Crispy Crepe Dentelle, Milk Chocolate Butter Cookies & Dark Chocolate Truffles, and included a full-sized, holiday greeting card. 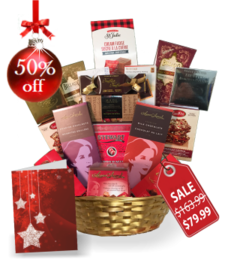 Click here to view the full Laura Secord Collection of holiday gift baskets. Lindt makes their amazing chocolate in Switzerland, for those of you who prefer a European taste. Lindt "Maîtres Chocolatiers" have been world renowned for the excellence of their chocolate, truffles and other confections since 1845, based on an old (and secret) family recipe. Now you can enjoy and send the decadence of Lindt chocolates this holiday, with a NEW collection of four Lindt gift baskets from Bloomex. The Lindt Collection baskets feature delectable treats such as gift boxed Lindor Milk Chocolate Balls with Smooth Centres, Lindor gift boxed Dark Chocolate Balls with Smooth Centres, and other tasty selections. These are combined with an assortment of other sweet treats such as cookies, peppermint crisps, truflles, and rich hot cocoa, with a full sized holiday greeting card to send your special message. 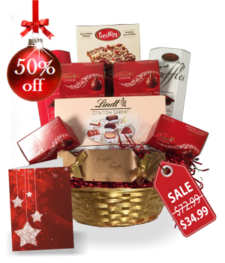 Click to view the full assortment of Lindt Collection Gift Baskets. Whichever special chocolate gift basket you select this holiday, your recipient is sure to be delighted! These make perfect holiday and Christmas gifts. Order now for holiday delivery across Canada.